You have already been introduced to Woody Taylor, as the winner of the Reserve High Point Open honors. He also competed in the Three Year Old Challenge during the World Show on One Time Bugsy, owned by Jennifer Frame. 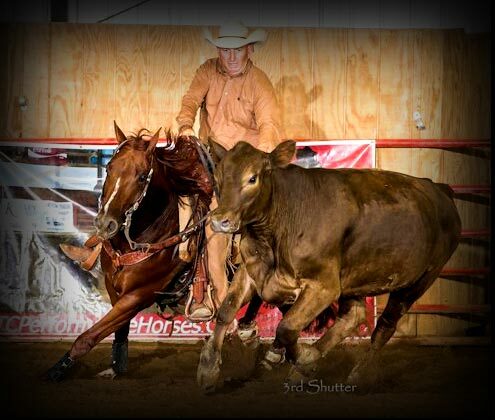 When Woody was at Todd Crawford’s place in Oklahoma last fall, he rode a number of 2 year old prospects. He knew that Jennifer was looking for a young horse to start and he suggested One Time Bugsy. Bugsy had pretty good breeding (One Time Pepto, and a High Brow Cat mamma). Woody describes him as balanced with a nice way of going. He thought Bugsy would rein or even cut, but it has turned out that he can do both pretty well. He is well on his way to being a Working Cow Horse. Woody says he has really wanted to show in the Three Year Old Challenge but “just never had enough horse.” He took Bugsy to one reining show before the World and he did okay. They brought him to Wilmington and that was the first time Bugsy was every really asked to win. Woody says he was not sure what to expect, but it turns out that Bugsy is a “show horse.” The horse stepped up and was ready to perform every time they went into the arena. Woody will say that he believes that Bugsy had a great World Show, and has a lot of potential. Jen Frame will tell you that Bugsy is with just the right person to teach him how to use all of that potential. Although Nathan doesn’t show, he comes to every show and is Jen’s best help. However, if the ARHA continues to offer Freestyle Reining, watch out – we might see Nathan horseback yet.